Follow a timeline when planning your wedding. Planning a wedding can be an emotionally trying time period, as it can be stressful organizing all of the little details that bring the day together. From booking a venue to hiring a caterer and choosing a wedding gown, everything that needs to be done to prepare for the big day has a specific time it should be done. 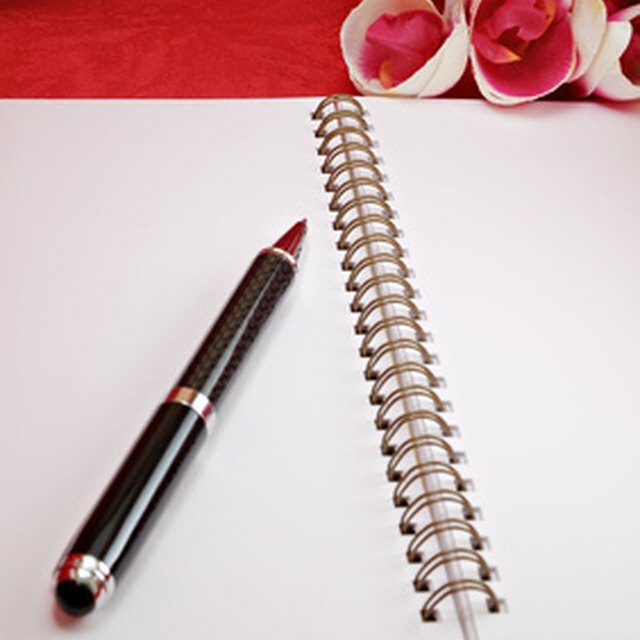 Use a wedding checklist to organize your wedding day, alleviate stress and ensure every detail of your day is perfect. Set a date for your wedding and announce your engagement. Set a budget for your wedding and divide the budget up by how much you are planning to spend on each aspect of the day. Talk to your family members to find out who will be contributing what financially for the wedding. Compile a guest list for your wedding and obtain the contact information for each person you plan to invite. Tour potential wedding ceremony and reception locations to choose the ones that are best for you. Book your venues and file the contract away in a binder for safe keeping. Send out "save the date cards" to everyone you plan to invite to your wedding. Research and book tastings with potential caterers and choose the caterer you want for your reception. File the contract away in a binder for safe keeping. Book you DJ or band for your wedding reception and file the contract in your binder. Research and meet with potential florists for your ceremony and reception. Book the florist of your choice and file the contract in your binder. Research and meet with potential photographers and vidoegraphers before choosing the ones of your choice. Book your chosen photographer and videographer and file the contracts away in your binder. Try on wedding gowns and have your gown ordered when you have chosen the one that you like. Meet with your caterer and choose the menu for your reception. Research and meet with potential bakers of your wedding cake. Book the baker of your choice and file the contract in your binder. Book the transportation for yourself and for your wedding party. File the contract in your binder. Purchase dresses for your bridesmaids. Set up your online wedding gift registry. Make all of the arrangements for your honeymoon including flight times and hotel reservations. Rent the formal wear for the groom and the groomsmen. Order or make your wedding invitations. Reserve any rental items you will need for the ceremony and reception such as chairs, tables and linens. Book your hairstylist and makeup artist for the wedding day. Appoint ushers and other wedding day helpers. Write or choose your wedding vows for the wedding day. Have your final wedding gown fitting to ensure all alterations are correct. Finalize your floral proposal with your florist. Have your bachelor and bachelorette parties. Call any of your invited guests who have not responded for a final head count. Finalize the seating chart for the ceremony and reception. Confirm all of the details of your wedding with your vendors.